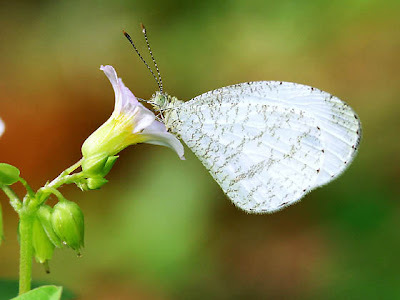 It has been a year since the Butterflies of Singapore BLOG started the Butterfly of the Month series in December 2007! 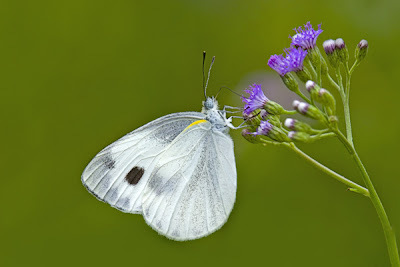 Time really flies, and it's been really great featuring a special butterfly each month, researching each species, and collecting the excellent photos from members of the ButterflyCircle community. 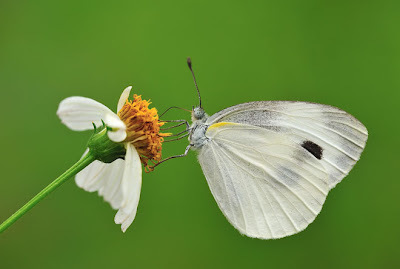 With the global economic crisis (yes, it even affects butterflies, well, actually the photographers, not the butterflies! ), it's been a tumultuous year for the world as we cross the threshold of the final month of 2008. All around the world, the 'winter' of the financial storm has hit home to many countries, and it will be a time of prudence and belt-tightening in many parts of the world. But there will always be time to stop and appreciate our beautiful butterfly friends, who are totally oblivious to our human material world. However, winter and white, no matter how depressing they are, often have their beauty and grace. Even in the most adverse of cold weathers, Mother Nature always presents her beauty in the seasons, and white winters are no exception. Butterflies are always admired for their colour and diversity. 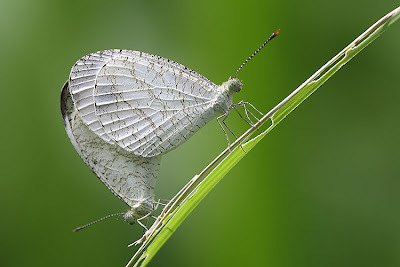 But, there are plain white butterfly species as well - but they are no less attractive, for there is beauty to behold in even the plainest and commonest of these species. 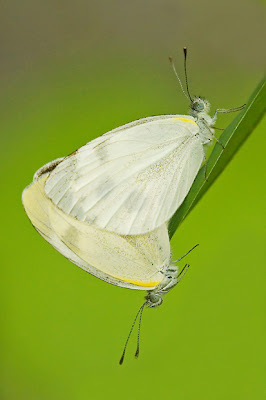 This month, we feature not one, but two white butterflies. Small, unassuming and plain, these butterflies are found very often in urban parklands and secondary growth, fluttering feebly and going about their business of feeding and enjoying their freedom in the natural world. The Psyche is a small and delicate butterfly. It is usually seen fluttering feebly, close to the ground, stopping only to feed on flowers. A favourite flower which it likes to feed on is the white bloom of the Common Asystasia (Asystasia gangetica). The upperside is white, with a black tipped apex and a black oblong subapical spot. The underside carries greenish lines and streaks. It can be found in both urban areas as well as forests. 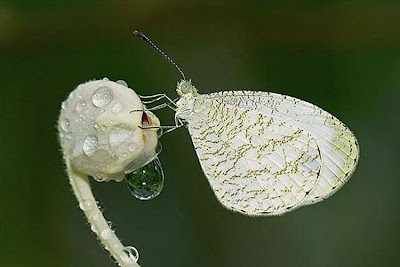 When observing this feeble flying butterfly, one has to be extremely patient to wait for it to alight to feed on a flower, or to take an occasional rest on a nearby leaf. 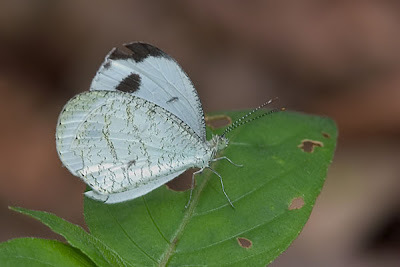 Though it has a weak flight, it can go on flying for long periods of time without taking a rest stop - butterfly photographers will find it a challenge to take a shot of this butterfly! 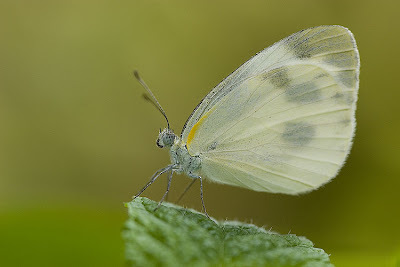 The 2nd white butterfly featured this month, is the Cabbage White. 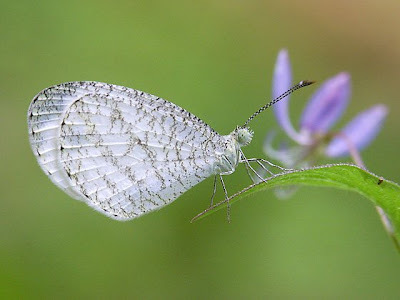 Another small inconspicuous butterfly, it occurs in mainly urban areas where its host plant, Cleome rutidosperma, which it shares with the Psyche, grows. 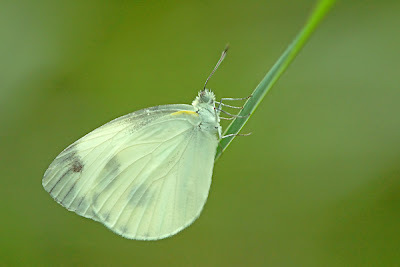 The Cabbage White has predominantly white wings, with usually a few black post-discal spots and a black apical border on the forewings above. The females are more heavily black-dusted, and possess a distinct double spot in space 1b of the forewing. In pristine specimens, there is a distinct yellow streak at the basal area of the hindwing below. This species occurs in open grassy areas and flies in the company of the Striped Albatross and Psyche. It is a weak flyer, and keeps close to the ground, looking for the flowers of common weeds to feed on. On a sunny day, it has a restless flight, and rarely stops for long. It occurs in urban areas as well as parklands and can sometimes be common where it occurs. Often, several individuals are seen at one time, especially in the vicinity of its host plant.